Here at GAK, we have a huge selection of keyboards and digital pianos perfect for players of any level or ability. If you're just starting out, we have we have a fantastic choice of keyboards for under £100 ideal for beginners and aspiring pianists, or for those tackling their grades we have a comprehensive range of digital pianos that range from lower budget starters to expertly crafted professional models. Furthermore, we stock large-scale workstation keyboards for stage performances and a HUGE range of synthesizers of all shapes and sizes too! We pride ourselves on being keyboard specialists and host a range of instruments for players of all levels and abilities. We stock brands such as Roland, Yamaha, Korg, Moog, Nord, Novation and many more! If you have any inquiries about keyboards, digital pianos, synthesizers or anything else, please don't hesitate to contact one of our experts by calling 01273 665 400. Excellent entry level digital piano for players of any ability bundled with all items you will need! 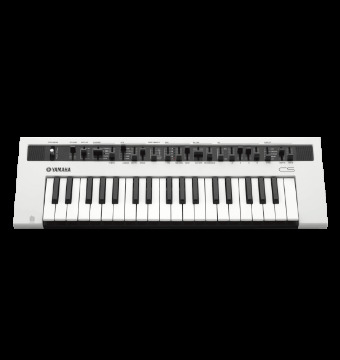 A full Sized Keyboard with acoustic style full-sized keys, 400 available tones, 100 drum rhythms and more. Comes with Music Rest, Headphones, Bench, Pedal. Digital Piano featuring the sounds of 3 world-famous concert pianos, providing pianists with every possible shade of musical expression. A full-fledged analog modelling synthesiser featuring a diverse selection of 200 stage-ready preset programs. KORG are back with their﻿ KROME music workstations, but this time they have brought a whole host of new colourways. The product of over 50 years of artistic vision and creative expertise, the Kronos 2 is one of the most versatile synthesizers ever made. KORG’s most powerful Synthesizer ever. Featuring 88 light touch keys and nine versatile sound engines. The Korg SP-280 provides users with a beautiful Piano sound matched with a stylish design that matches your decor. A stunning digital piano, perfect for home use. A beautiful and affordable piano for players of all levels and abilities. Professional but easy way to create and produce music, at home, on stage or in the studio. Flagship YAMAHA technology in an affordable and lightweight keyboard, introducing MODX! The Montage is one of the most flexible synthesizers on the market right now. One of the most flexible synthesizers on the market right now.